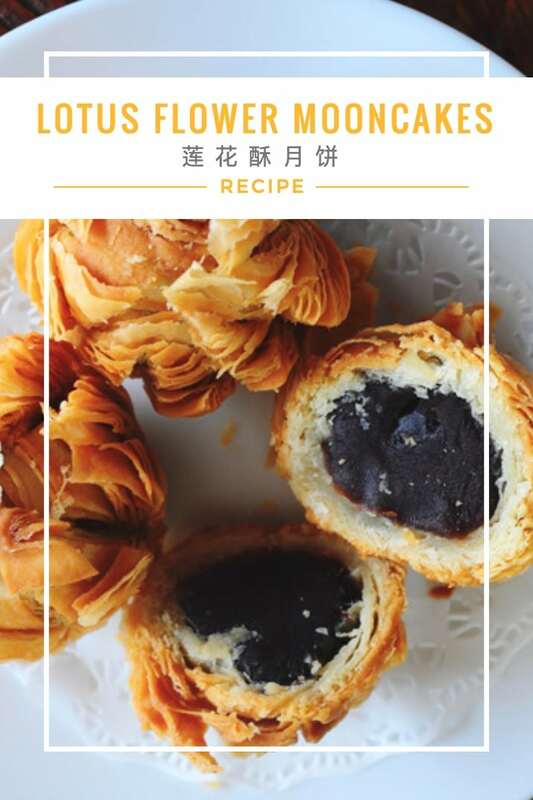 These Lotus Flower Mooncakes (梅花酥月饼) are a classic deep-fried version mooncakes with red bean paste filling and crisp puff pastry. These mooncakes are amazingly pretty looking when fried and taste so delicious, especially when eaten fresh. 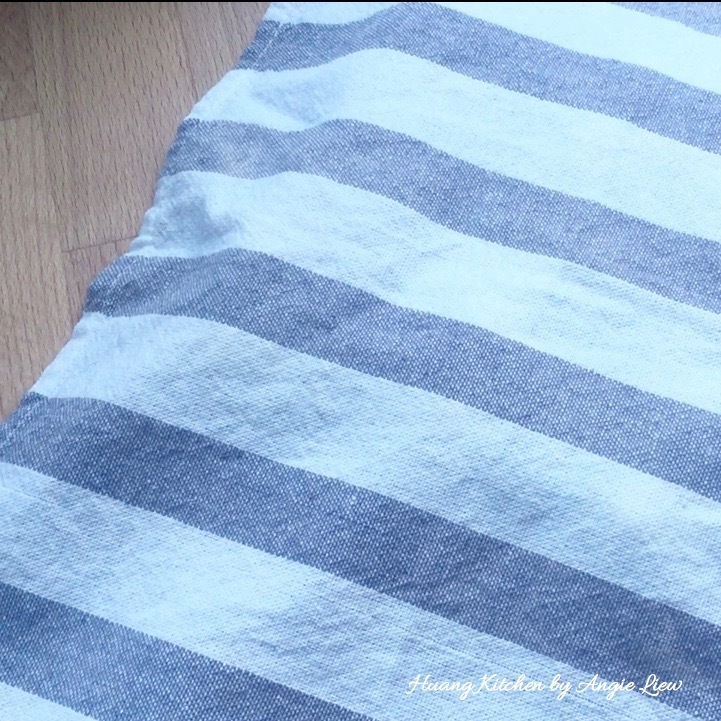 Although a bit laborious, preparation is not too difficult. It will definitely be all worth it when you take the first bite once its done! 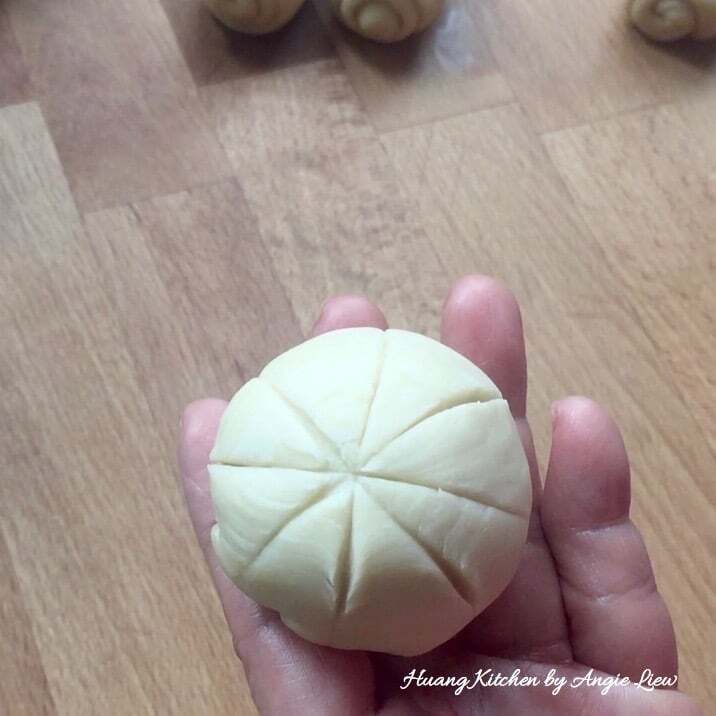 The uniqueness of these mooncakes lies in the dough or the crust. It uses the basic method of puff pastry to create the many layers and extremely crunchy crust. 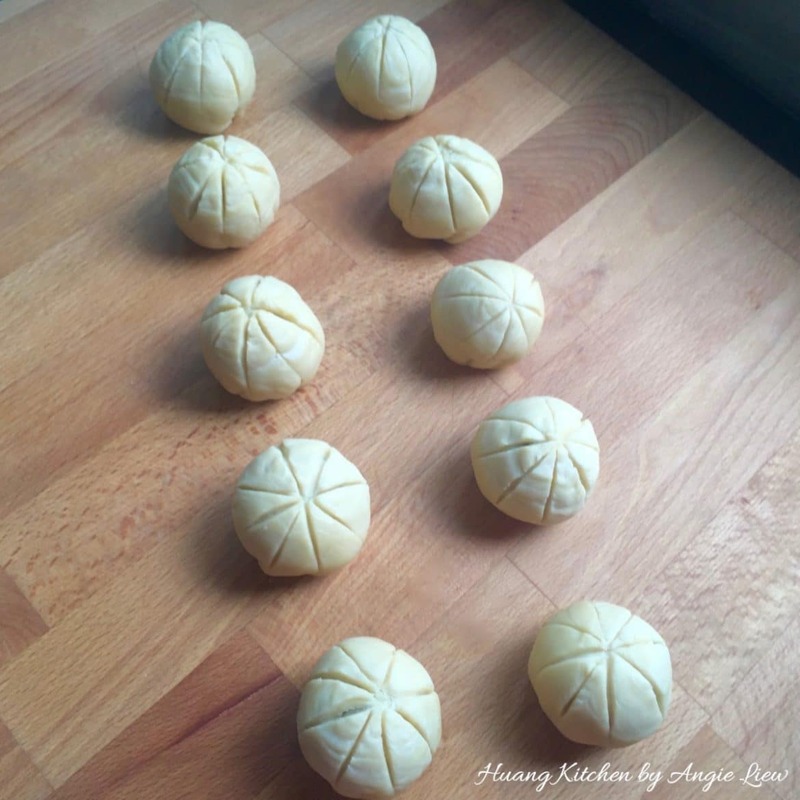 And for once, no fancy mould is required to make these mooncakes. 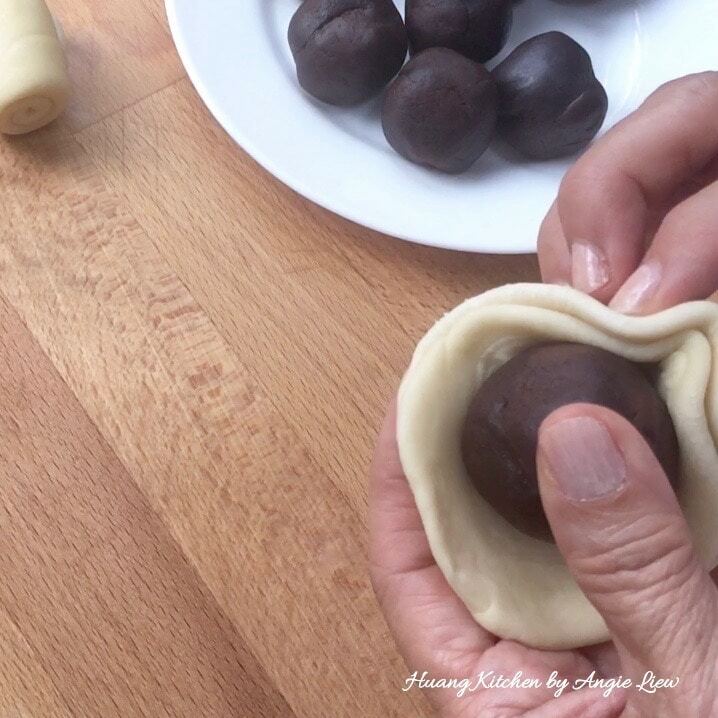 Why not spruce up the festive mood by making these pretty looking mooncakes, in conjunction of the Mooncake Festival coming up soon. 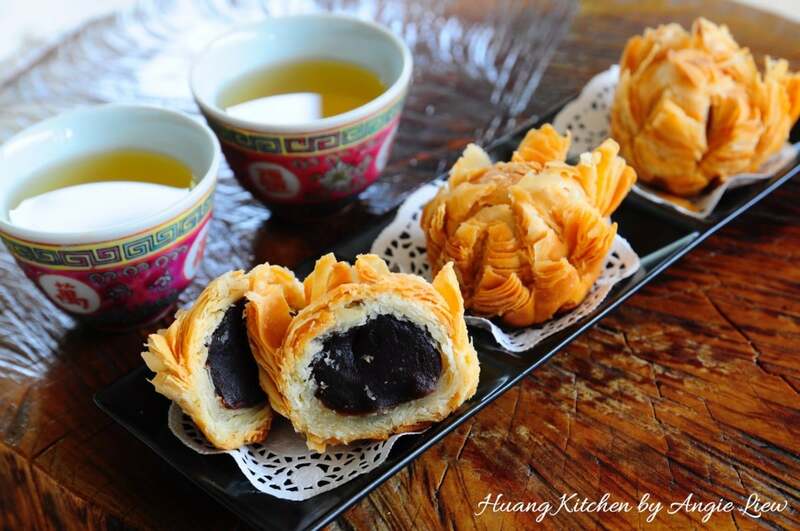 These mooncakes also make the ultimate tea time snack that you can enjoy anytime, not just for the festive season only. Satisfaction guaranteed. As always, ENJOY! 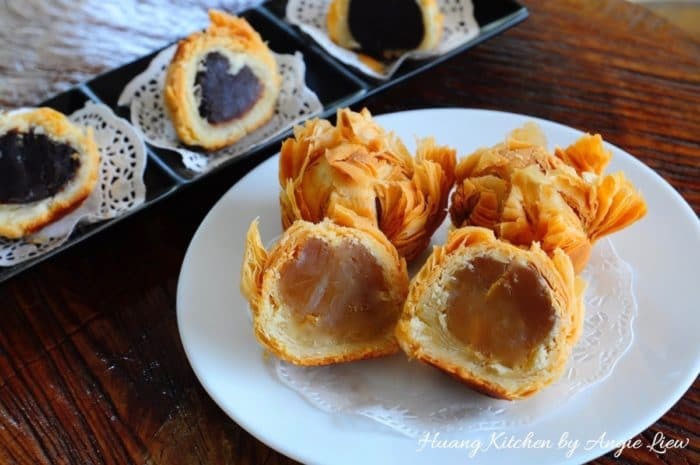 These Lotus Flower Mooncakes (梅花酥月饼) are a classic deep-fried version mooncakes with red bean paste filling and crisp puff pastry. Looks impressive and tastes marvellous, satisfaction guaranteed. First, prepare the mooncake filling. 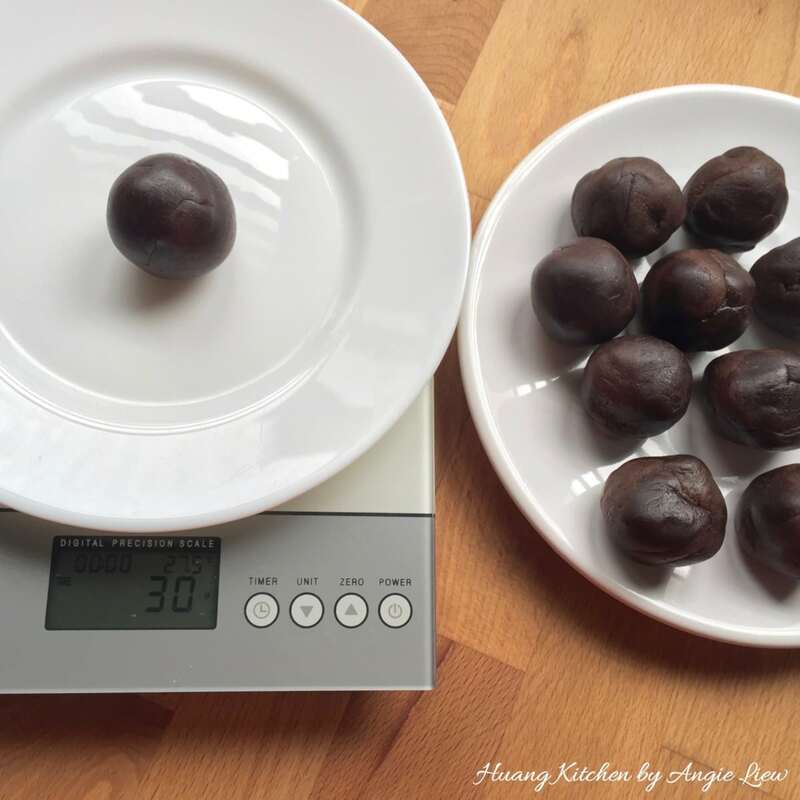 Divide the red bean paste into 10 equal pieces, 30g each and roll into balls. Then, prepare the mooncake skin. 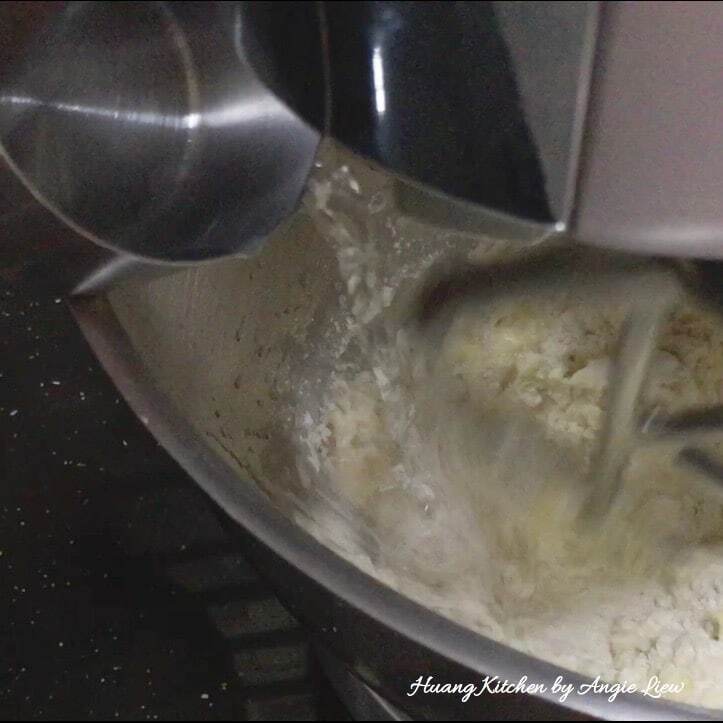 Mix all ingredients for WATER dough in a stand mixer till well combined and a soft dough is formed. Set aside the WATER dough to rest for 10 minutes. Then, divide the rested dough into 10 equal pieces, about 30g each. 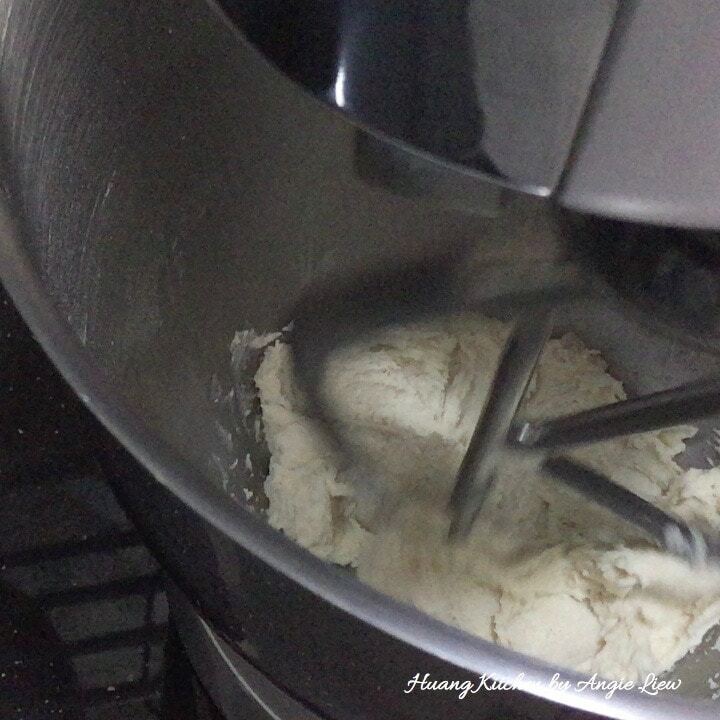 While waiting for the WATER dough to be ready, mix ingredients for OIL dough in the stand mixer till well combined. Then, divide the OIL dough into 10 equal pieces, about 15g each. 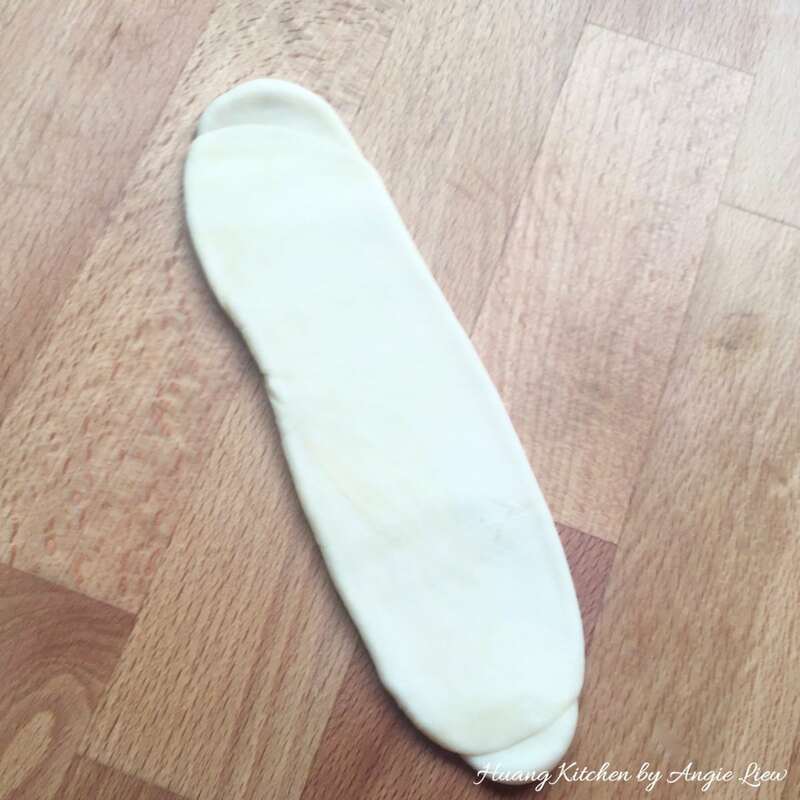 Flatten the WATER dough and wrap the OIL dough in the flattened WATER dough. Form into a ball. Then repeat the same for the rest of the water and oil doughs. 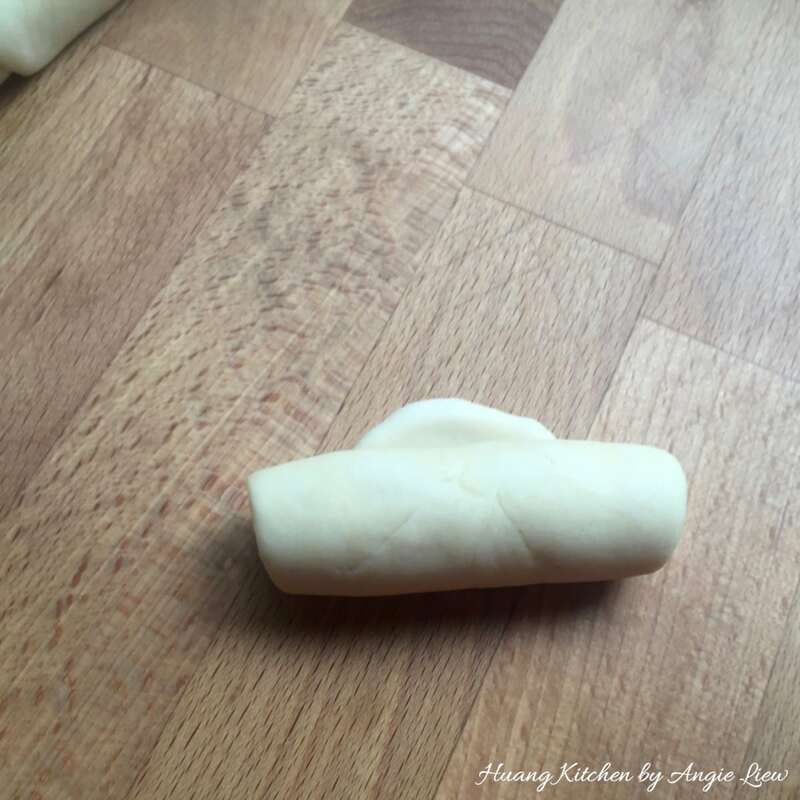 Next, roll the dough flat with a rolling pin. Then roll up the dough Swiss Roll style. 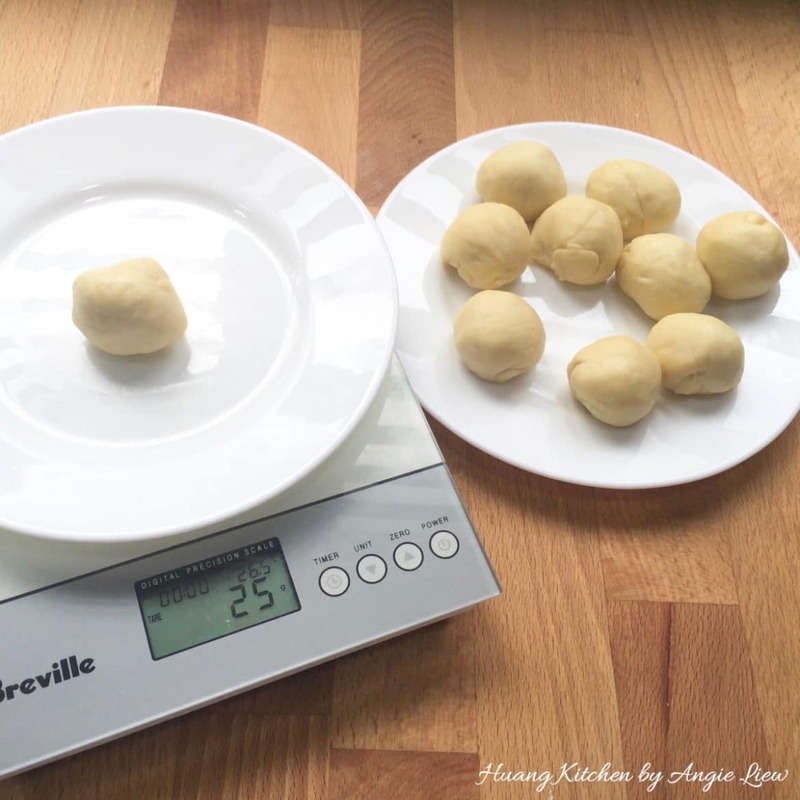 Repeat to do the same for the rest of the combined dough balls. 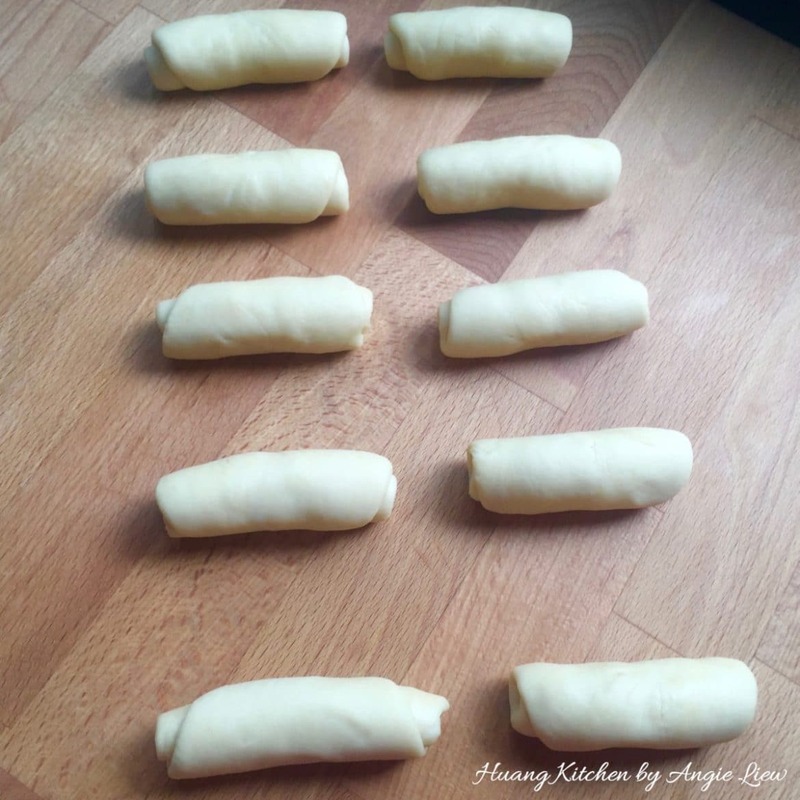 Roll the rolled dough flat again. Then, roll up the flattened dough Swiss Roll style again. Repeat the same for the rest of the rolled doughs. 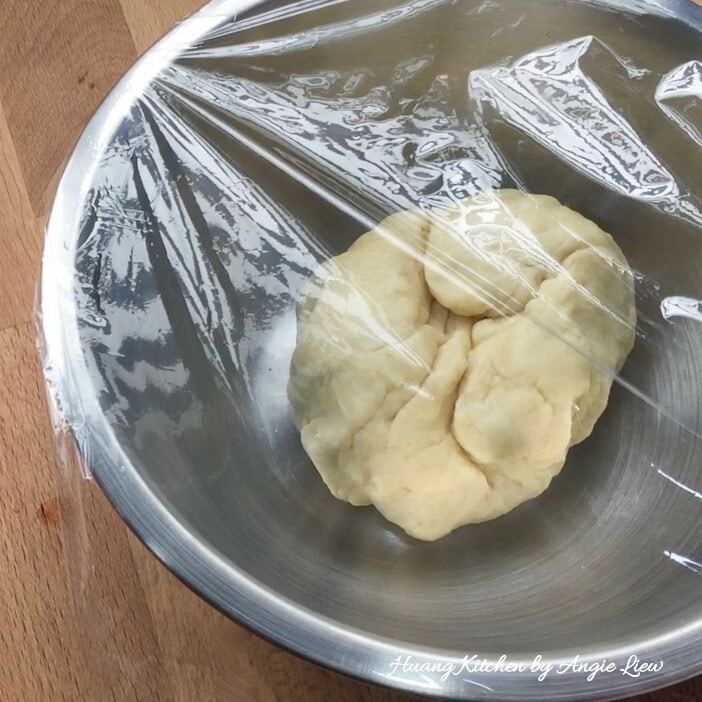 Cover and allow the dough to rest for 10 minutes. And we're ready to make the mooncakes! 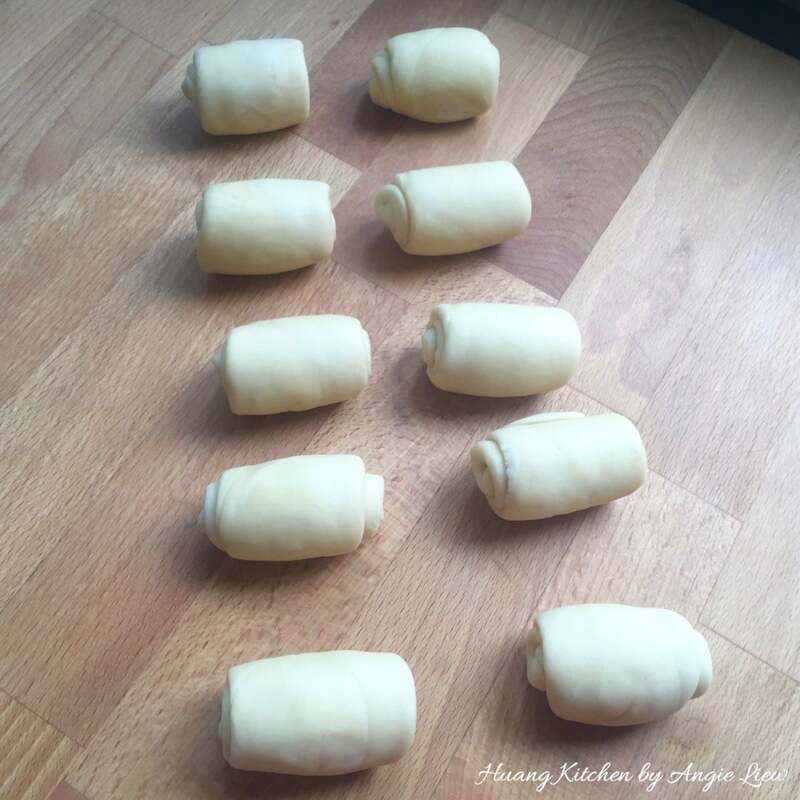 First, cut the rolled dough in halves. 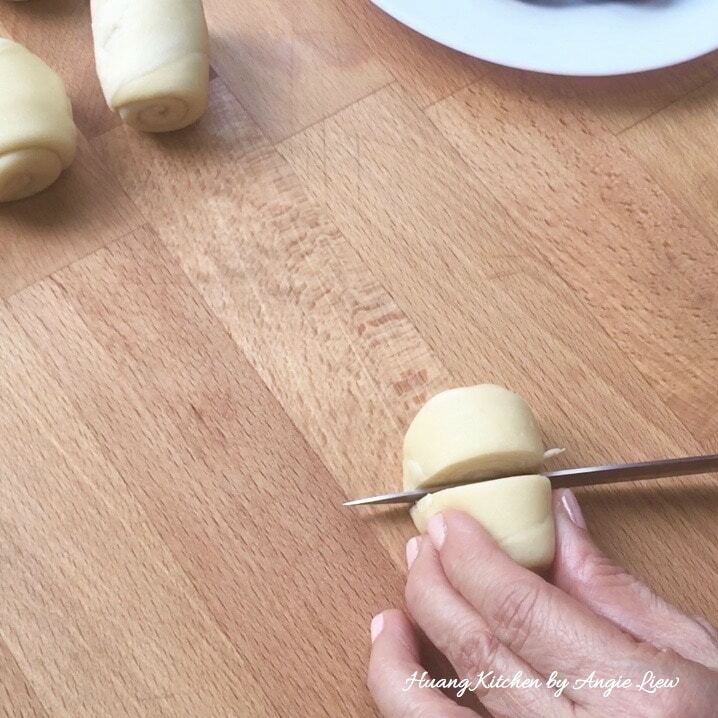 With cut side DOWN, roll each of the cut dough flat, about the same size. 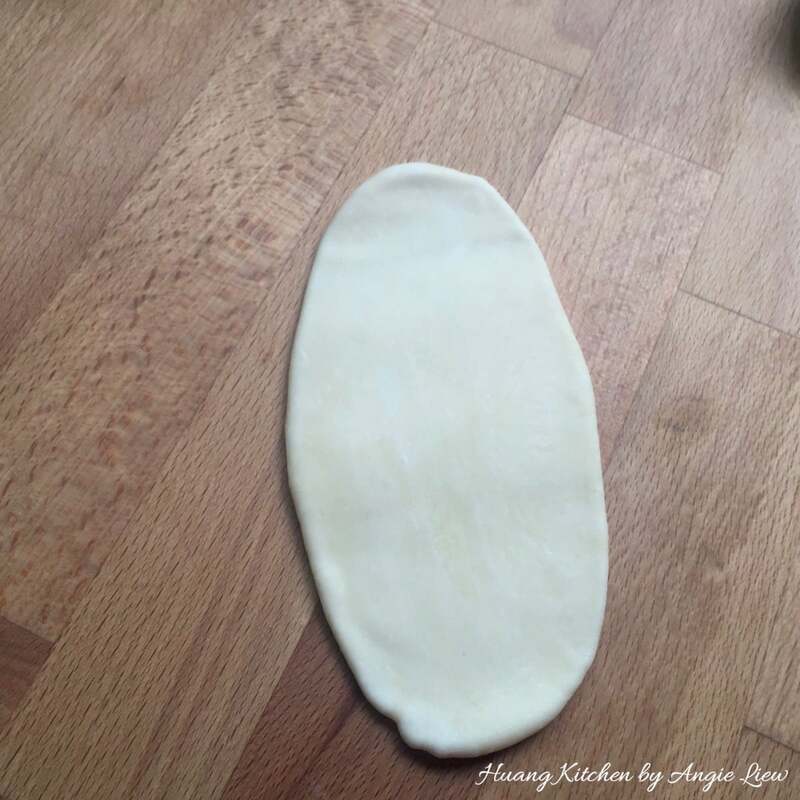 Place the 2 flattened dough one on top of the other. Then wrap the red bean filling with the dough and pinch the dough securely to secure the seam. 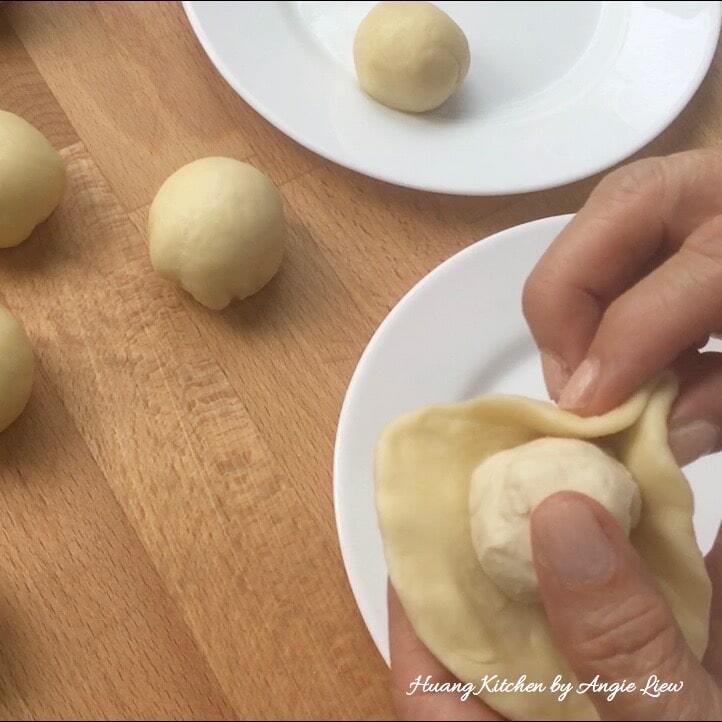 Roll the dough and form into a ball. Next, cut 4 lines on the top of dough with a small knife making sure not to cut into the filling. Repeat the same for the balance of the rolled dough. And we're ready to deep fry the mooncakes! 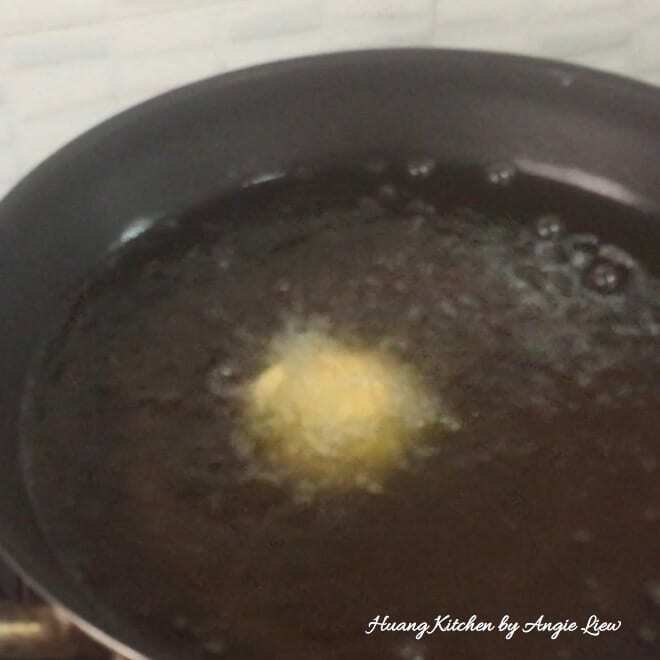 First, heat up oil in a wok. 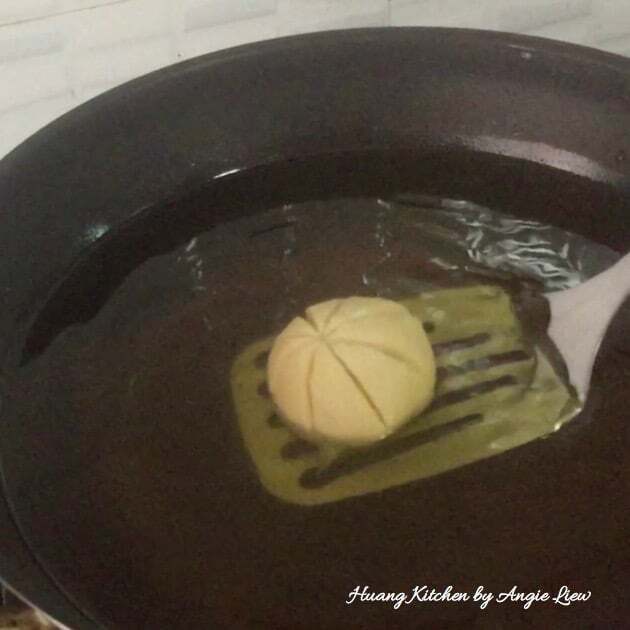 When oil is hot enough, gently lower the mooncake into the hot oil, making sure the mooncake is fully submerged. 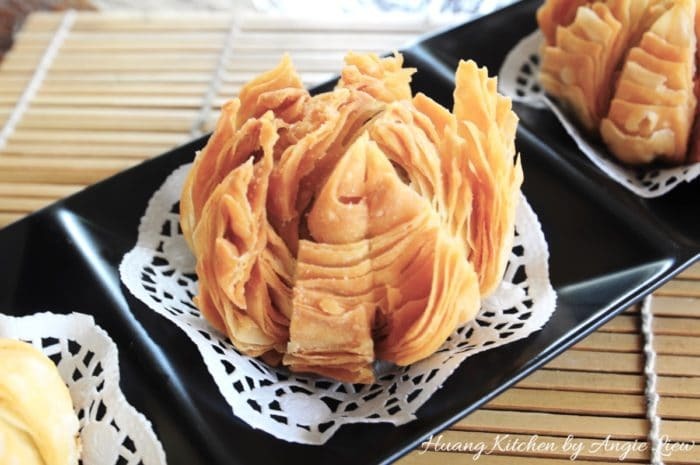 Lower heat to low and SLOWLY deep fry the lotus mooncake. 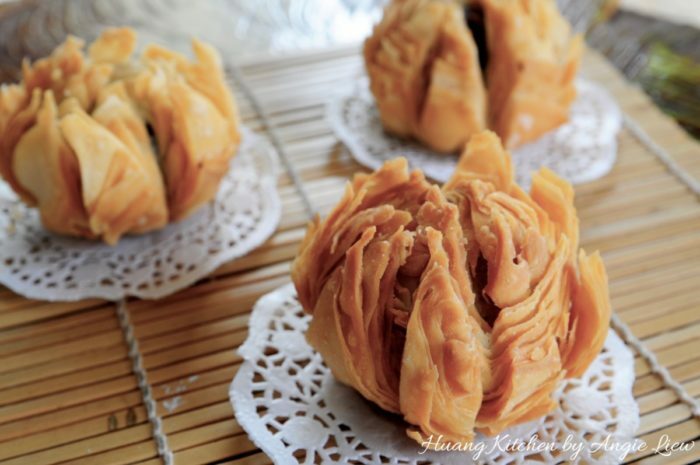 Deep fry till the mooncake turns golden brown and the pastry skin opens like a lotus flower. 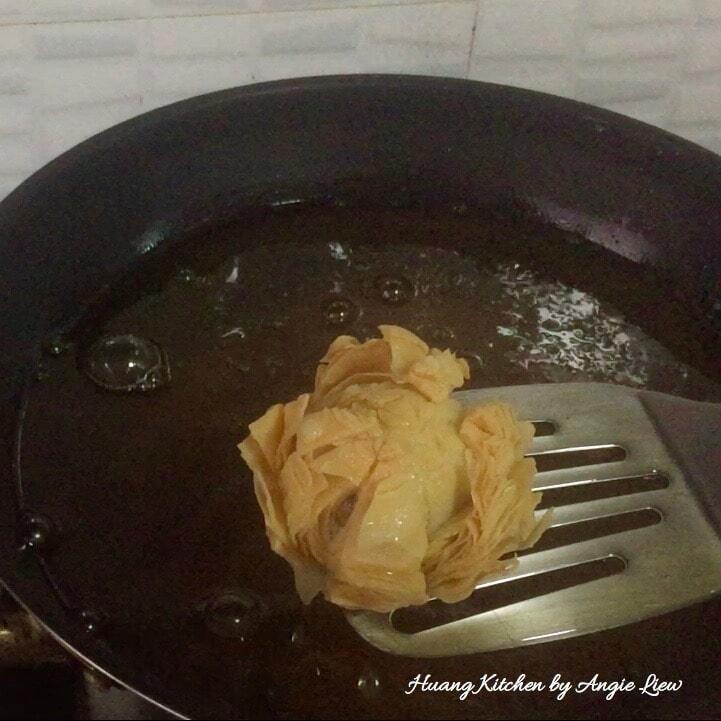 Then remove from wok and drain the golden lotus mooncakes on paper towel. And we're done! 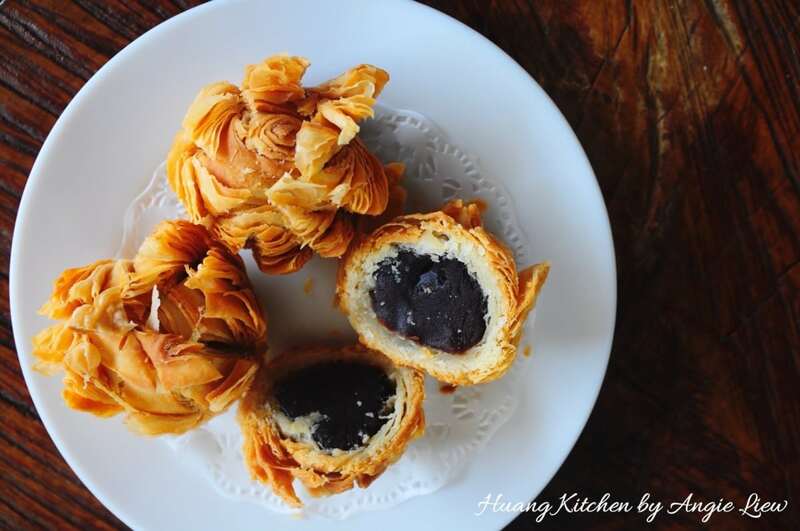 These crispy lotus mooncakes taste best when served fresh. As always, ENJOY! Make sure the dough (water dough) is not too dry. 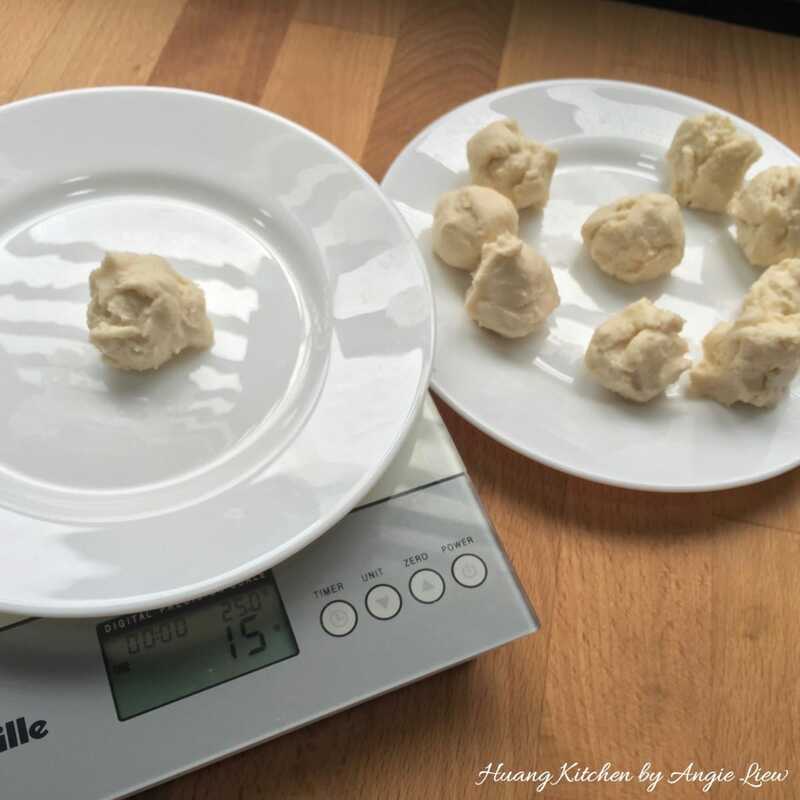 To test, form a dough ball and press it flat and the edges should not crack. 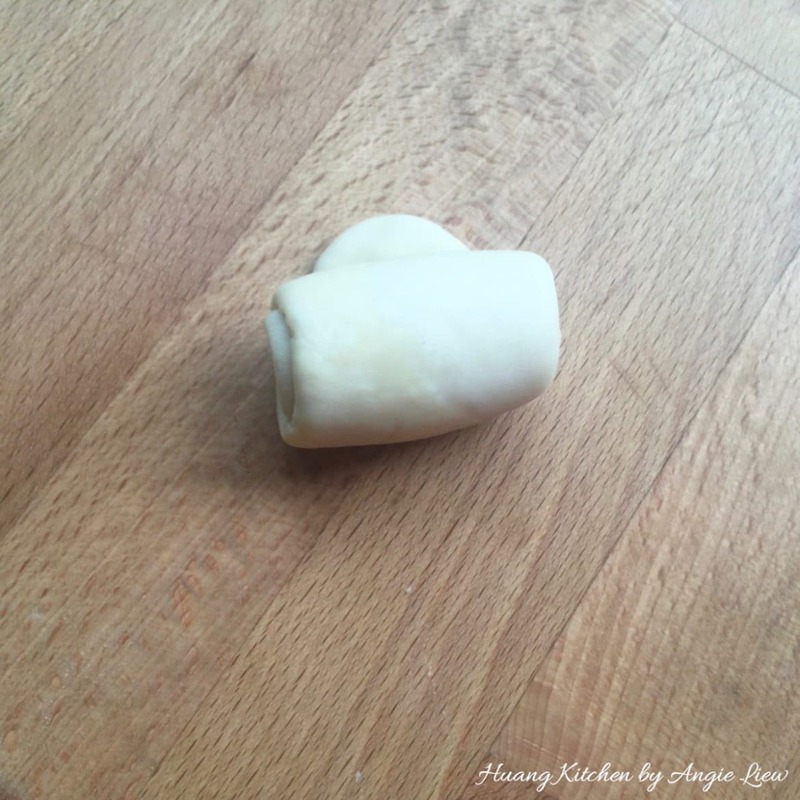 Cover all the dough pieces with a damp towel or cling wrap to prevent them from drying out as you work. These are ideally eaten fresh. 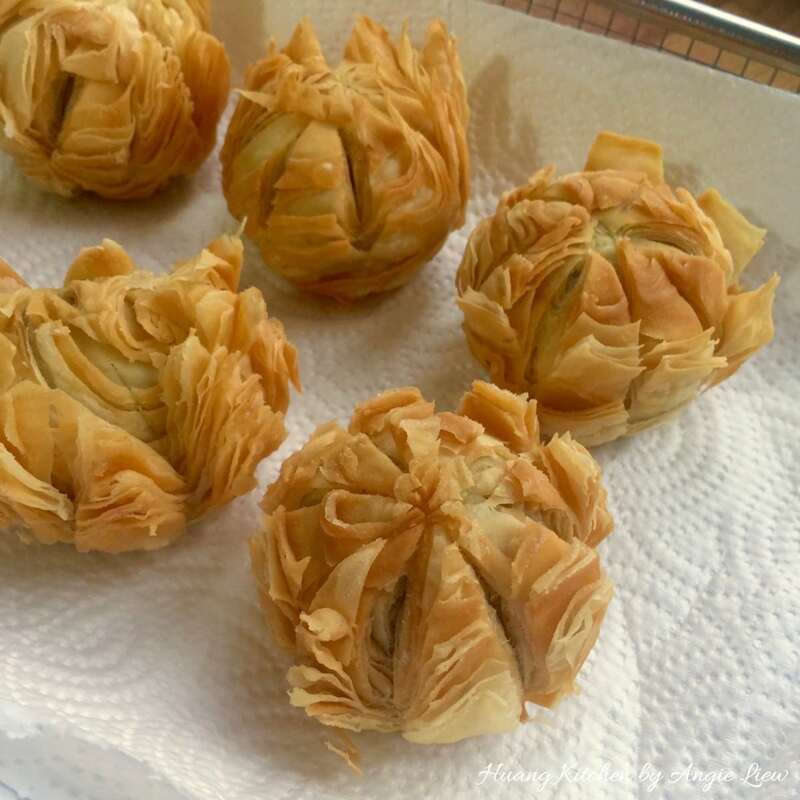 However, you can freeze the uncooked mooncakes and only deep-fry only when needed. Wait at least half an hour after taking out of the freezer before you fry them.